Baltimore Harbor Lighthouse – Chesapeake Chapter U.S.L.H.S. The Lighthouse Board’s original request for $60,000 to build a lighthouse was made in 1890 to mark the entrance to the Baltimore channel at the mouth of the Magothy River. Those funds were approved by Congress in 1894, but after extensive testing which revealed a layer of soft mud 55 feet below the surface of the shoal, it was concluded that an additional $60,000 was needed. The additional funds were approved in 1902. In 1903 the bidding process was opened but only one contractor submitted a bid, which was $80,000 above the original $120,000 allotted. A new bidding process started and William H. Flaherty of Brooklyn, NY was awarded the construction contract at a price of $91,900. In August 1904, the 48-foot square caisson was launched and on September 19, the caisson was towed to the construction site and lowered to the bottom. Two days later, “heavy seas filled the cylinder which…caused it to settle to one side, about 7 feet out of level.” On October 12, a severe storm pushed the caisson “flat on its side”. At this point the contractor terminated operations, saying that he would return in the spring, but he never returned. The government sued the contractor and by the fall of 1905 the task of completing the project was in the hands of the United States Fidelity and Guaranty Co.
A plan was then developed to bring the caisson back to a level position. In the spring of 1906, a U-shaped pier was constructed around the caisson to support worker’s housing, a hoisting machine, storage for material and equipment, ten A-frames, three compressors and a steam engine. By November 20, the caisson was within 17 degrees of vertical. Work was stopped for the season and resumed in April 1907. The caisson is eventually brought to an upright position and then sunk 82 feet below sea level. In 1908 the Lighthouse Board reported that the work was a success and the light was officially commissioned on October 1, 1908. The caisson of the lighthouse rests on 91 piles driven into the bottom and positioned 88 feet below high tide. The 24 by 24-foot two-story octagonal brick house sits on a 30-foot diameter caisson foundation that expands into a trumpet shape at the top. The upper portion of the foundation is the basement of the lighthouse which stored oil, coal and provisions. The first floor was the main living space for the keepers, with a sitting room, kitchen and storage space. The second floor contained two bedrooms. The third level, or watch level, contained a mansard roof covered with slate tiles. It was equipped with a fourth order lens with a flashing white light every 10 seconds. In 1923, the fourth order lens is changed to acetylene, the fog bell is replaced with a fog horn and the keepers are transferred to Point No Point Lighthouse. 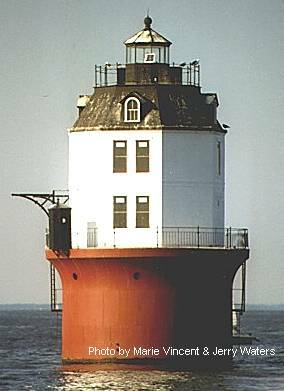 On May 20, 1964 the Baltimore Light became the first and only lighthouse powered by nuclear energy. Two years later the reactor was removed, and a conventional electric generator was installed. Today the lighthouse is operated by solar power. The lighthouse was listed on the National Register of Historic Places on December 2, 2002 and was eventually sold in 2006 at a price of $260,000 to a partnership of four couples. Bay Beacons, Linda Turbyville, 1995.